Mike Meyer had his prized Superman collection stolen from him. A story broke last week that spread across the internet, shocking everyone that read it. As STL Today reported, Mike Meyer, who has been on Social Security for a mental disability for over half of his life, was robbed of his nearly all of his enormous collection of Superman memorabilia. Six decades worth of comic books and items ranging from old-time radio and a television bearing Superman’s likeness, were all stolen by a former co-worker of Mike’s. After this news broke, it traveled faster than a locomotive to comic book news sites, among them Comic Book Resources and Comics Alliance, where the outreach to help Meyer replace his stolen collection has been truly heroic. After Stack Exchange’s CHAOS team was made aware of the “replace-the-collection” campaign, we decided to act. Thor Parker, Midtown Comics’ Marketing and Events Coordinator, directed me to this post on the Midtown Comics blog which contains an address where replacement Superman items can be sent. Midtown themselves have been champions of this cause, donating some choice Superman items to Mike (including a copy of Justice League #1 signed by Geoff Johns and Jim Lee at a recent Midtown Comics event). Inspired by their act of generosity, the Stack Exchange CHAOS team took a field trip to Midtown Comics. The store always has exciting sales going on, and this unofficial company trip was in the middle of a 40% off back issues sale. To the back issue bins! We picked out a healthy stack of Action Comics and Superman back issues as well as current Superman adventures published monthly by DC Comics. CHAOS agents Katey and Aarthi picked out some cool items (wall decorations, hats and magnets! ), but we all had our eye on one thing…statues. I’ve never bought a statue at Midtown comics, but the Superman vs. Bizarro Ultimate Showdown statue was crazy tempting. We had to get it. The Midtown employees were more than happy to track the statue down and even took it out of the box to let me inspect it. They were incredibly friendly and knowledgeable and have probably convinced me that I need to buy a lot more statues for myself. 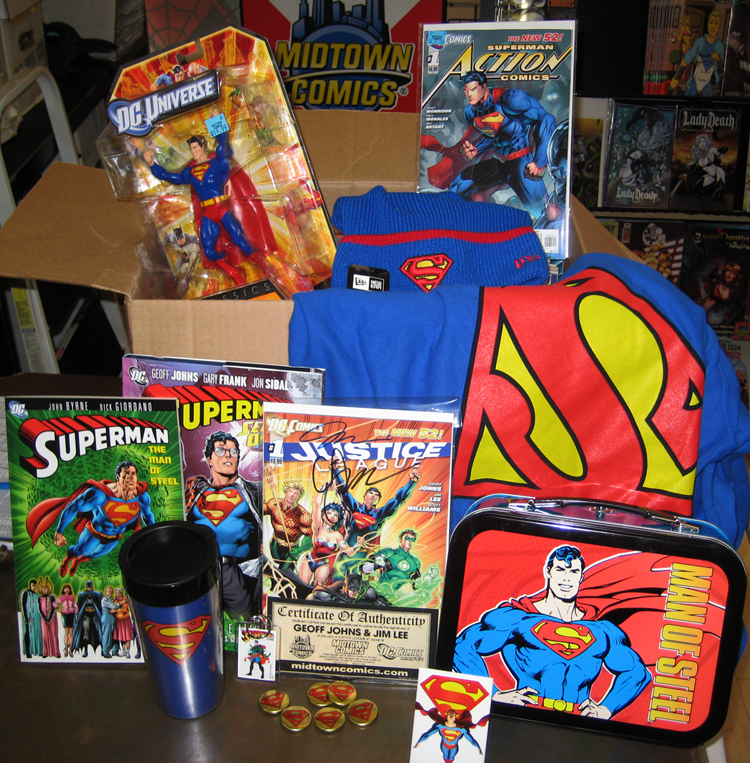 After finalizing our Superman swag, we checked out, returned to the Stack HQ and shipped the items off to Mike. Stack Exchange was very excited to be able to help out a person in need, and is very thankful to Midtown Comics for making us aware of this initiative, having a great selection of items, and generally being a great store. UPDATE: Comic Book Resources reported over the weekend that Mike’s collection has been recovered and the criminal caught. A truly happy ending to this tale!